Description: BNSF Dash9-44CW 1039 and 1093 lead a westbound container train on the Cuba Subdivision at Allen Road, Crescent, Missouri, USA, 3 January 2003. Description: BNSF 1093 is incharge of this NS westbound freight. It also had a KCS and UP unit in the consist but no NS power was found. Description: BNSF consist approaches Mound City Rd. Description: Heritage 1 led consist waiting at the signal on the Main Street overpass. Description: Rare consist of five BNSF paint schemes and a demonstrator, led by a Heritage 1, awaiting signal just east of Kentucky Street. Description: Heritage I led consist heads for the Mississippi River and Arkansas. 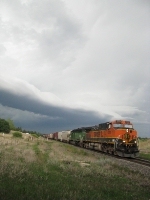 Description: The first nortbound grain train, this one, a BNSF. Description: I was actually trying to get the CEFX train again, but I ended up beating this guy to a road crossing just north of Winlock. Description: Z-SSECHC1 rolls across the Big Dig. This section of track was washed out during flooding in August 2007. Description: Yet another H1 Dash9 shows up in the area. Westbound out of the Midway Intermodal Hub. The rear of the train is visible in the distance. Description: continueing south down the Joint line. Description: These Units just emerged out a a "violent" storm in the horizon. Description: To the hostler at Galesburg, FLIP THE POWER! Description: A clean H1 leads the Z-PTLCHC this morning - NICE!